In a recent notice of proposed rulemaking, the Trump administration claimed that the Flores settlement agreement led to an increase in the number of families arriving at the United States’ southwest border. 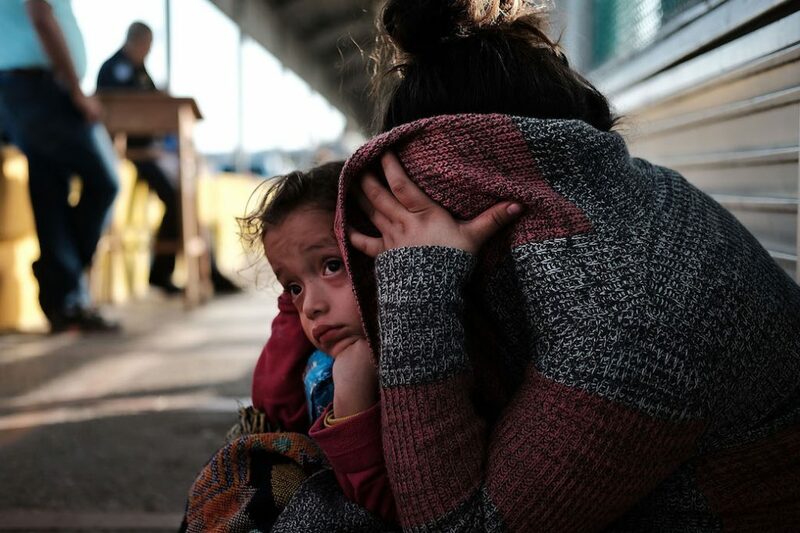 The Flores agreement sets conditions under which the federal government can detain children—including, as interpreted by the courts, that they cannot be held for more than 20 days in unlicensed, secure facilities—and a July 2015 federal court ruling made it clear that the settlement’s protections apply to accompanied, not just unaccompanied, children. 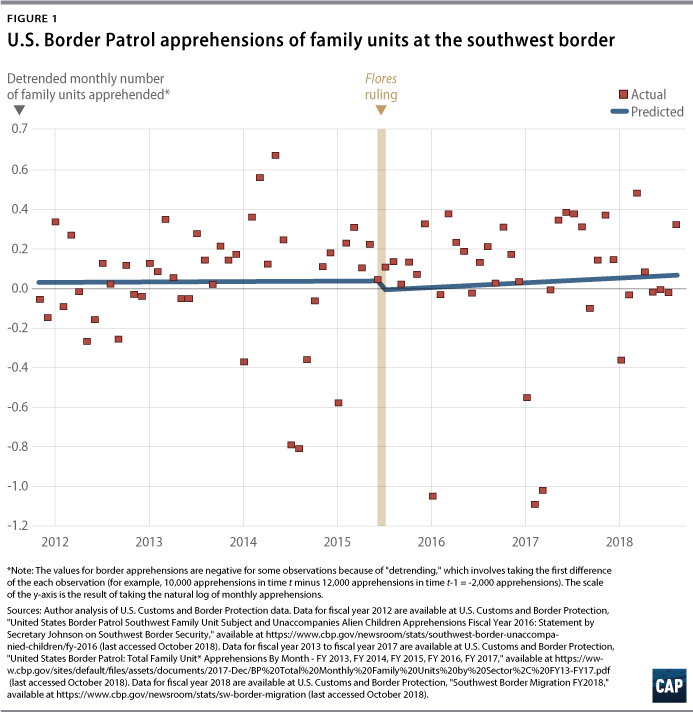 Previous CAP analysis showed that neither the expansion of family detention under the Obama administration nor the Trump administration’s separation of children from their parents at the southwest border have deterred families from coming to the United States. The analysis in this column, additionally, illustrates that the data do not support the administration’s new claims about the July 2015 court ruling. Moreover, a series of models were run specifying pseudo-interventions—meaning different start dates for any purported effect from the July 2015 Flores ruling—to address the possibility that more time needs to elapse before an effect is evident. The pseudo-interventions analyzed include the six months after the July 2015 Flores ruling. 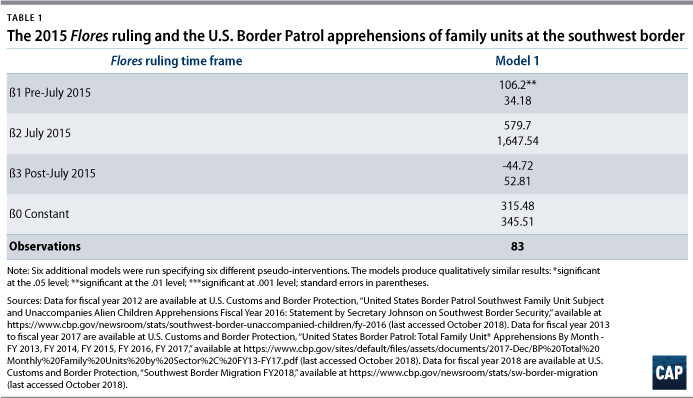 * These models produce qualitatively similar results: The July 2015 Flores ruling is not statistically significantly related to increases in the monthly number of U.S. Border Patrol apprehensions of families at the southwest border. After seasonal trends are taken into account, the July 2015 Flores ruling remains statistically insignificant related to increases in the monthly number of family apprehensions. Figure 1 illustrates the results after time trends are removed. Despite the administration’s attempts to connect Flores’ limits on the length of time and its conditions under which the federal government can detain children, the data are clear: There is no statistically significant relationship between the July 2015 Flores ruling and the monthly number of apprehensions of families at the southwest border. Tom K. Wong is a senior fellow for Immigration Policy at the Center for American Progress and associate professor of Political Science at the University of California, San Diego. His latest book is The Politics of Immigration: Partisanship, Demographic Change, and American National Identity. *Author’s note: These models specify the intervention as August 2015, September 2015, October 2015, November 2015, December 2015, and January 2016. Table 1 presents the results of the ITSA analysis. Model 1 estimates the relationship between the July 2015 Flores ruling and the monthly number of U.S. Border Patrol apprehensions of families at the southwest border. As Table 1 shows, in Model 1, the ß1 coefficient is positive and statistically significant, which affirms that the monthly number of apprehensions was increasing before July 2015. Both the ß2 and ß3 coefficients are statistically insignificant, however, which shows that the July 2015 Flores ruling is not statistically significantly related to an immediate or long-term increase in the monthly number of apprehensions at the southwest border. Table 2 reports the results of the ARIMA ITSA. Model 2 shows that after identifying and removing time trends, there is no statistically significant relationship between the July 2015 Flores ruling and the monthly number of U.S. Border Patrol apprehensions.